Flying out was easy enough, and one of my athletes (Justin Arnosky), wanted to run the 50k, so we met up at LAX, and then drove to our baller Airstream rental, in Topanga Canyon. 0300 – Wake up, eat a Clif Mojo bar, and a banana. Then go back to sleep. 0400 – Drive out to the race site, chug a coffee, and eat some Clif Bloks. 0500 – Race start. This was SUPER cool. 200+ runners, all in headlamps, strung out in a line, all heading out into the mountains, in total darkness. One of the most memorable race starts of my life. 0520 – The first real climb started. Everything felt good. I was casually jogging along, and walking any time the climb got steeper than roughly 5%. 0600 – Finally finishing the first climb, at about mile 6. Calves are feeling pretty fatigued from the climb, but everything still feels good, and I’m working my way through people who went out too fast. Lots of smiles, and in a great mood. 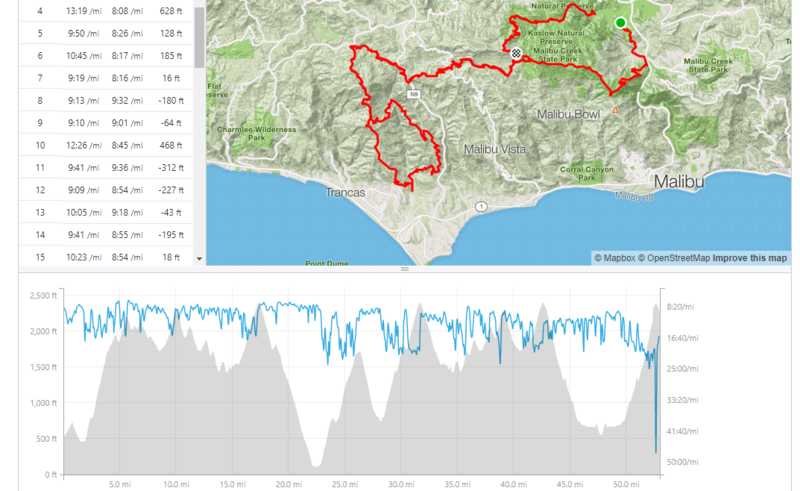 0615 – Some moderately technical descents, and I’m getting passed by more skilled descenders, but… eh, that’s ok. I didn’t show up to win, the only goal was to finish. 0700 – Somewhere around mile 13. We’re up along a ridge here, and I’m rolling along pretty nicely. The sun is up, and I’ve put my headlamp away. It’s a spectacular morning. All smiles. 0730 – Here we go… up another big climb. The woman in front of me is running all of the steep sections, and I’m briskly walking them. Oddly enough, I’ll catch, and pass her, by the end of the climb. Ultras are weird, man… pacing is everything. 0800 – The start of a 5 mile descent, at 9-10%. This… is not so fun. Every step sends shooting pain through my quads, and I get passed by several people. The lack of downhill running in my race prep is coming back to haunt me, and I’m starting to enter a pretty dark place. My internal dialogue is starting to include some swearing. On the positive side, we’ve made it out to the ocean, and the views are SPECTACULAR. 1000 – Finally… a descent. I mean, I wasn’t thrilled about running downhill, but at least it was a chance to get back some time, after going up the climb so slowly. 1100 – After another climb, I’ve FINALLY arrived at the mile 31 aid station. I chugged about 4 cups of coke, and hung out for several minutes, just to gather myself. I also popped in the headphones at this point, for the mental boost. Also, right after leaving the aid station, I took a bathroom pit stop. My urine was VERY dark, to the point where I couldn’t tell if I was dehydrated (brown), or if there was blood in my urine (red). So, I just crossed my fingers, hoped it was just dehydration, and started sucking fluids. Over the next hour, I put down my entire hydration pack (2 liters). 1200 – Arrived at the mile 36 aid station. Check my urine color, and it’s pretty normal. Great success! Turns out it wasn’t blood in the urine… it was just plain old dehydration, and I had fixed it. Woot! Also, I slammed a Red Bull at the aid station, and yeah… it helped. I took off out of that aid station like I had rockets on my heels. This was all good, until about mile 39, when I kicked a large rock, VERY hard. Stubbed my toe, and pulled about half of the muscles in my upper body, just trying to maintain balance. This completely broke my rhythm, and then things became a bit of a struggle, the rest of the way to the mile 42 aid station. 1515 – Leaving the mile 49 aid station, but things are flat for a bit, so I’m able to jog. Then… things are not flat. I start going up the climb that I had just come down, which means 5 miles at 8-10%. There is no pretense of even pretending to run. My legs are obliterated. This is all just brisk walking. And I’m PASSING people. So yeah… it was rough out there. 1645 – Finally back to the top of the climb at mile 54-ish, which means I have 8 miles to the finish, and it’s mostly downhill. This is not a pleasant thought. Every step feels like someone is shocking my quads at max level with an electrostim machine. This is awful. 1730 – I realize that the sun is going to set, before I finish, and… I don’t have my headlamp. This is a problem. So, I gradually catch up to someone with flashlight, and ask if I can tag along with him (Joe Pope). Luckily, he’s cooperative, and agreed to let me tag along, as he lit the way. Every step was painful, but having company made it quite a bit more tolerable. We chatted most of the way home, and actually ended up having quite a bit in common (both engineers, both Navy guys). 1900 – Finally freaking finished! Final time was 14:12:36. Justin was a super good friend, and waited at the finish line for 6+ hours after he finished the 50k. We got out of there, and went straight to In-N-Out Burger… I could only put down about half of the food I ordered, but… man, it was gooooood. In one sense, this was a great success. Because my only goal was to finish, and I accomplished that. But, I also know that I was wildly underprepared for this event. I underestimated the soft-tissue damage that all of the descending would cause, and I didn’t adequately prepare for it. My quads and calves started going at around mile 20, and were completely wrecked by mile 40, and then it was a death walk/shuffle for the next 22 miles. My biggest run training week was only about 60 miles, and it included very little descending, very little strength work, and… it showed. My leg muscles just weren’t prepared to handle the overall load of the eccentric loading. But, you reap what you sow, right? I’ve never been in that much “involuntary pain”, in my athletic career. Don’t get me wrong, I’ve been in ABSOLUTE AGONY during rowing races, and triathlons. But that was all “voluntary”, as I could have made the pain go away, if I chose to slow down. I was in pain because I was choosing to go fast. But at Sean O’Brien, the simple act of just “moving forward” was causing extreme pain. There were no “outs”, there was no way to mitigate the suffering. The simple act of finishing was the struggle, as opposed to “going fast” being the struggle. I’m not complaining about this, at all. In fact, that’s exactly what I signed up for. It’s what I wanted. It was just a new to me, and a life experience worth going through. Also, on a big positive note, systematically, I was fine. I nailed the fueling, and the one time I got dehydrated, I was able to recognize it, and solve it. For the next few months, I’ll be going back to normal triathlon training, as I get ready for the 2018 racing season. But this fall, I’m going to shift my focus completely to ultra-running. I know the errors I made in my preparation for Sean O’Brien, and I won’t make those same mistakes again. My training will include both more mileage, and a LOT more strength work, and then I’ll start looking for ultras to run next fall/winter. I’ve pretty much tapped out my potential in triathlon, and it’s time to explore something new. At this point in my career, I just find ultra-running to be a lot more interesting than Ironman. After this summer’s triathlons, I really don’t know if/when, I’ll return to triathlon. Maybe in 2019, or 2020, or maybe never… who knows? We’ll find out, right? It’s an adventure!